Mist settled over the pine trees clustered on the mountainside backdrop of the stunning Sealaska Heritage Institute in Juneau, Alaska. First Peoples Fund’s Indigenous Arts Ecology (IAE) program regional convening was underway, though not in the way we’d planned. Mechanical issues on the ferry and too much fog for a plane ride prevented us from visiting the Chilkat Indian Village in Klukwan. Past Community Spirit Award recipient Lani Hotch (Tlingit) had planned to host us to see their thriving arts ecology. In a community of fewer than 100 people, they have built a strong tourist destination with a culture center, public art, and artists’ work to celebrate and preserve their culture. 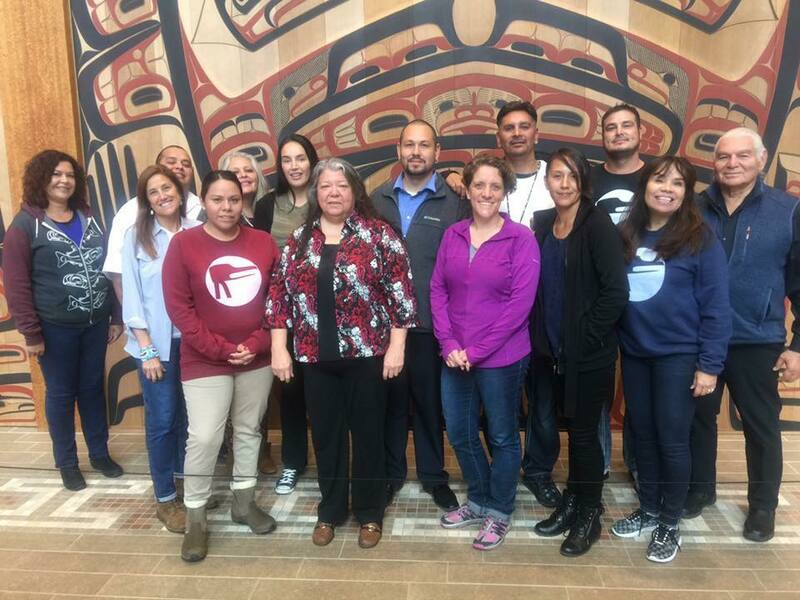 Since we were unable to witness the work in the Chilkat community firsthand, the Sealaska Heritage Institute in Juneau welcomed our convening into their facility. The group settled in the Clan House — built by past Community Spirit Award (CSA) recipients David A. Boxley (Tsimshian) and his son David R. Boxley (Tsimshian) — within the Sealaska building. The facility also highlights art by former CSA recipients Nathan Jackson (Tlingit), and Chilkat weaver Anna Brown Ehlers (Tlingit), a 2017 National Endowment for the Arts National Heritage Fellow. We shared introductions between staff, facilitators and representatives of the IAE grantees — Four Directions Development Fund (Red Lake), Lakota Funds (Pine Ridge), Northwest Native Development Fund (Colville) and Native American Community Development Corporation (Browning). Each area partner brought one or two artists because, at its heart, an Indigenous Arts Ecology is an artist-led movement. The program is about building better infrastructure for artists within tribal communities. Theresa, a former FPF board member, CSA honoreee, and National Endowment for the Arts National Heritage Fellow, recognized the symbol of success the Juneau area represents for Indigenous artists in the modern economy. “The First Nations people of that land treated us very well,” said First Peoples Fund artist fellow and trainer John Pepion (Piikani). He represented the Northwest Native Development Fund at the convening. FPF staff brought together our relations in the Juneau area to create an Indigenous Arts Ecology experience for the grantees. Crystal Worl — 2017 Artist in Business Leadership fellow and co-owner of Trickster Company — made time in the chaos of her schedule to come to Sealaska and introduce herself. She was amazed to see three people wearing Trickster apparel as she shared her story of how helpful First Peoples Fund was to her and her Juneau-based business that promotes Indigenous design. Her brother Rico Worl — who had opened the convening with a blessing — and Crystal started Trickster Company with a long-term vision of being part of the growing art mecca in Alaska. Crystal invited five of the IAE guest artists to her home, where she served seal she’d butchered and salmon she’d caught. “Everyone we met in Alaska was knowledgeable, kind and generous,” John said. He enjoyed his first experience in that state. With the constant mist and fog, it felt like a chilly rainforest as a group from the convening hiked up the Mendenhall Glacier and took in the view. On the banks of the lake near Nugget Falls, a black bear ambled out in front of them. The highlight of the convening for John happened when Ernestine Saankalaxt’ Hayes (Lingit) spoke. Ernestine is the 2017 Alaska State Writer Laureate. Weaver Anna Brown Ehlers involved the group’s hands with preparing goat hair by rolling it. She demonstrated Chilkat weaving, giving everyone an opportunity to experience the culture. The IAE program is still in its early stages — developing and moving much like the work in the expansive and rural Alaska areas. Though we weren’t able to make it to the Chilkat community, Juneau demonstrated a successfully growing Indigenous Arts Ecology in a challenging climate.